Google's global affairs head, Kent Walker, said: "We've always agreed that healthy, thriving markets are in everyone's interest. Google's "AdSense for search" product delivers those adverts for website publishers. From 2009, Google started replacing the exclusivity clauses with "premium placement" clauses, which meant publishers had to keep the most profitable space on their search results pages for Google's adverts and they had to request a minimum number of Google adverts. The restrictive clauses "led to a vicious circle", Ms Vestager said in a media conference. "Google's rivals, they were unable to grow, and to compete, and as a result of that, website owners had limited options for selling advertising space on those websites, and were forced solely to rely on Google," she said. 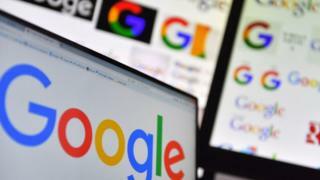 "There was no reason for Google to include these restrictive clauses in their contracts, except to keep rivals out of the market," she added.